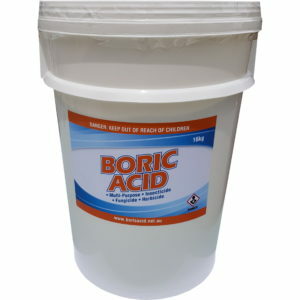 Boric acid is a white or clear-coloured, odourless, and tasteless compound. It is a mild acid which is relatively non-toxic to humans and non-carcinogenic, and a wide variety of uses in the home. It also is used in cosmetic and pharmaceutical products, in pest control, and even in manufacturing. Here are the three most common uses of boric acid in the home that we’ve found. 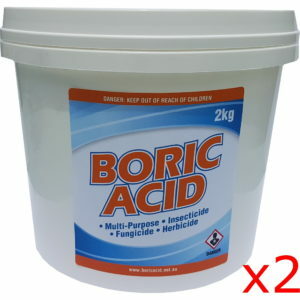 Boric acid is considered one of the most effective and natural way to get rid of those pesky pests in your home. 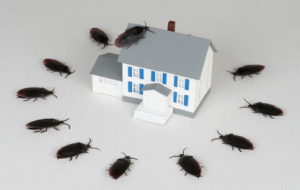 It is used to kill cockroaches, ants, fleas, termites, silverfish, beetles, wood borers, and other parasites. When ingested, boric acid works as a stomach poison and dries out the insect’s body. It also breaks down the wax on the insect’s outer shell and is absorbed into the body. Unlike with other poisons though, insects don’t develop immunity to boric acid. What’s more, it isn’t a repellent, so they won’t avoid the places where you’ve applied it, but keep coming back and getting poisoned. You have two options here: you can either buy a pesticide with boric acid as the main ingredient, or you can create your own. Mix equal parts boric acid and flour and dust all over your home, especially in the cracks and corners of your house where they hide. You’ll have to keep the window open while doing this though, to minimize the chance of inhaling the substance. Don’t forget to vacuum after. The insecticidal powers of boric acid can also be extended to furniture. A mixture of boric acid and water can be sprayed or painted onto wood to protect it against harmful insects like termites or beetles, wood rot, and fungi. Another option is to drill a hole in the wood and insert into it a pellet or water-soluble capsule with boric acid. 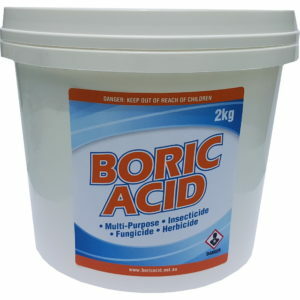 Boric acid is a natural antiseptic, anti-fungal agent, and astringent. A teaspoon of boric acid in four ounces of distilled water makes a good wash for wounds, rashes, minor burns, or as an acne treatment. It also relieves the itch from insect bites. A teaspoon in four cups of water can be used to treat sore eyes, irritation, or weird eye discharges. Because of its anti-fungal properties, it is also used to treat candidiasis or vaginal yeast infections. Simply place boric acid powder into an empty capsule, and insert down there twice a day. The infection is sure to disappear in two to three days. Boric acid dissolved in water is also an effective cure against athlete’s foot and ear infections caused by fungi from swimming pools. 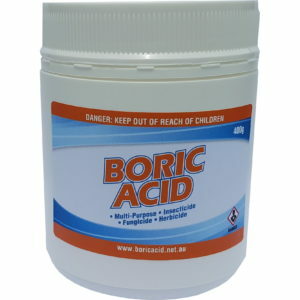 Boric acid can also be used as a cleanser, stain-remover, disinfectant, deodorizer, and mould-killer. To remove stains and odour from clothing, simply add half a cup of it to your regular laundry load. You can also use this to clean your sinks, floor, bathroom, and windows. Put half a cup of boric acid into your toilet bowl and leave for 30 minutes. Not only will it remove stains, it will remove the odour too. To deodorize a refrigerator, sprinkle a thin layer of powder on and leave for 15 minutes. Then, wash the powder away and wipe dry. A mixture of water, hydrogen peroxide, and boric acid can be very effective at removing mould. Spray this on affected areas and scrub away. Make sure to do this while the mould is wet, or the spores will go airborne and cause sicknesses, or transfer to another area. That’s our top 3, but there are so many more uses. 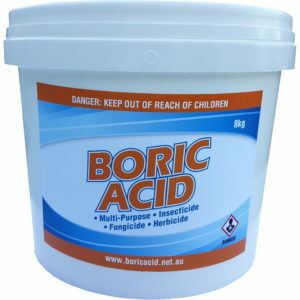 If you have a use of boric acid you’d like to share, please leave a comment below. Would boric acid harm or kill earth worms? I love earth worms!!! Yes boric acid would kill earth worms. I’d suggest not using it on them. We love them too. bottle ? states 100 percent boric acid. Yes, it’s the same one that kills roaches, only ours comes in the jar. The purity of our boric acid is at least 99.5%. I’ve never seen a 100% pure boric acid as there’s always some impurities. Works great at healing up your dry cracked cuticles to sores irritations on your bum or any where else .I put some Vaseline in a small container and mix in some boric acid till the lumps dissapear. Enough boric acid may kill rats, but there are better rat specific options on the market which are safer. 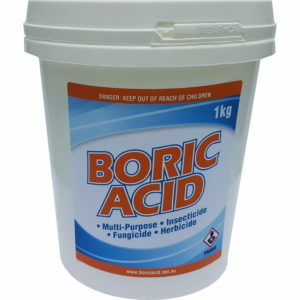 This boric acid works great as a cleaning agent.